Baghare Baingan, let me first explain you the literal meaning of these terms. “Baghar” means tempering or tadka and baingan is eggplant so if you combine the two terms this recipe would be of tempered eggplants. I mention the word temper/tadka often in my Indian recipes, so what actually is tempering? 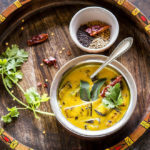 In Indian cooking tempering or tadka is the process of heating oil and adding spices and other flavorings to it and then transferring that oil to your dish. 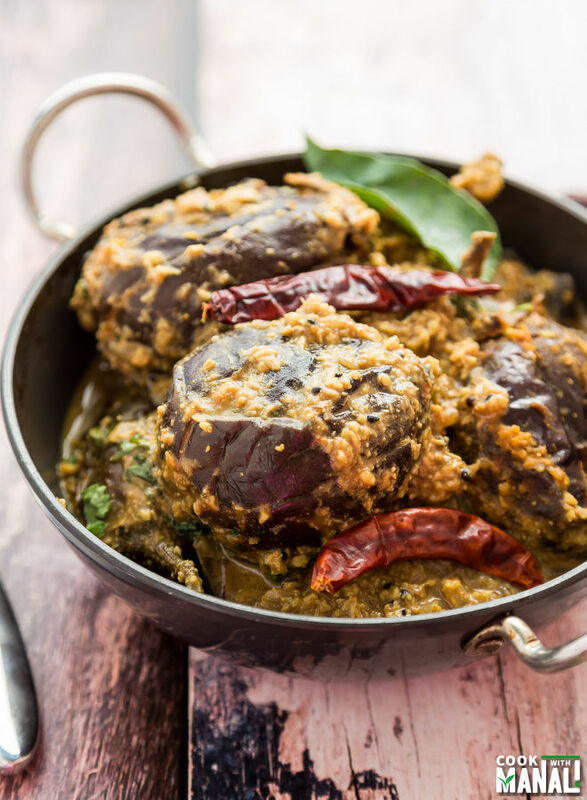 This eggplant recipe has it’s origin from the city of Hyderabad in India and is also popular in Pakistan. Baby eggplants are deep fried and then cooked with a paste made from fresh coconut, peanuts and sesame seeds. Isn’t that a wonderful combination? The fact that it is Vegan is a bonus! Even though eggplants are deep fried for baghare baingan, I shallow fried them in 2 tablespoons of oil. Looking at the amount of sweets/desserts I make people might find it hard to believe that I actually also care about calories! Hey I do that’s why I shallow fried my eggplants 😛 But no seriously, I am addicted to fitness as well, maybe not as much as baking but I love it nonetheless and while I love my desserts I try to keep my everyday food as healthy as possible. 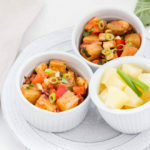 Coming to this recipe, I have been wanting to make these for so long! The last time I got baby eggplants, I made this > Borani Banjan, which by the way is one of my favorite ways to eat eggplant. If you love eggplants, you must try this amazing Afghan recipe! Anyway this time when I got these eggplants from the grocery store, I was very sure that I was going to make Baghare Baingan and I’m so glad I did because they turned out wonderful. There is a lot going on here in terms of spices but don’t be intimidated by the long list. The most important part of this recipe is to roast peanuts, sesame seeds, coconut and poppy seeds and then grind it to a fine paste. You need to roast till you start getting a nice aroma, around 4-5 minutes on medium heat. While grinding do not add a lot of water, add 1/2 tablespoon at first and add more only if required to grind it all together. When you add this paste to the curry, look on medium heat for 4-5 minutes till it’s well cooked. 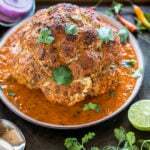 Like with any curry, you get the best taste only when you cook slowly on medium-low heat. Little sugar and some tamarind pulp is added to give the curry a sweet-tangy flavor. Peanuts, sesame seeds give it a nutty flavor and make this one appetizing recipe! This is one amazing way to eat eggplants and even those who dislike eggplants otherwise would like this. Wash and pat dry all the eggplants. Take 1 eggplant and make one slit horizontally and one vertically, but be careful not to cut through the entire length. We don’t want to cut the eggplants into pieces, it should remain attached with the stalk. Repeat the same with all the eggplants. In a pan heat 2 tablespoons of oil on medium heat. Add the eggplants and cook on medium heat. Traditionally eggplants are deep fried in this recipe so you can go ahead and add a whole lot of oil and deep fry them if you want to. Cook till eggplants are little soft, around 10-12 minutes. You don’t want them to be too soft. Remove the eggplants from pan and place on a kitchen towel. In a pan dry roast coconut, peanuts, sesame seeds and poppy seeds (khus khus). Roast for 5-6 minutes till you get a nice aroma. Transfer the roasted mix to a blender. Add little water and blend it to a fine paste. I added around 2-3 tablespoons of water. Set aside. In the same pan in which you had fried the eggplant, add 1 tablespoon of oil on medium heat. Once the oil is hot add mustard seeds and let them crackle. Then add onion seeds (kalonji) and fennel seeds (saunf). Saute till they sizzle. Add chopped green chilli and curry leaves and mix. Add chopped onions and cook till they are translucent. Then add ginger-garlic paste and cook till the raw smell goes away, around 2-3 minutes. Once the ginger-garlic is cooked, add the dry spices – cumin powder, coriander powder and red chilli powder. Also add the salt. Add around 1/2 of water and cook the spices for 2-3 minutes. The water is added to make sure the spices don’t burn. Add the coconut-peanut paste that we had earlier made to the pan. Add turmeric powder and paprika powder and cook the paste for 5-6 minutes on medium-low flame. You can add little water again if you think the paste will get burnt. Add the fried eggplants to the masala and mix. Now add 2 cups of water, this might look like a lot of water but the curry will eventually be quite thick. Cover and cook on medium-low flame for 15-20 minutes. Stir 2-3 times in between. Open the pan and add garam masala, tamarind pulp, sugar and mix. Switch off the flame and add some fresh coriander leaves to the curry. * Use fresh coconut for best taste and results. I didn’t have access to fresh coconut and hence had to use whatever was available. In a pan dry roast coconut, peanuts, sesame seeds and poppy seeds (khus khus). Roast for 5-6 minutes till you get a nice aroma and then transfer to a blender. Add little water [if required] and blend it to a fine paste. Set aside. Add the eggplants and cook on medium heat till eggplants are little soft, around 10-12 minutes. Remember you don't want them to be too soft. Remove the eggplants from pan and place on a kitchen towel. In the same pan add 1 tablespoon of oil on medium heat. Once the oil is hot add mustard seeds and let them crackle. Then add onion seeds and fennel seeds. Once the ginger-garlic is cooked, add the dry spices - cumin powder, coriander powder and red chilli powder. Also add the salt and mix. Cook the spices for 2-3 minutes, add around 1/2 cup of water to make sure spices don't burn. Now add the coconut-peanut paste to the pan. Add turmeric powder and paprika powder and cook the paste for 5-6 minutes on medium-low flame. Now add 2 cups of water, cover and cook the curry on medium-low flame for 15-20 minutes. Add garam masala, tamarind pulp, sugar and mix. Switch off the flame, add some fresh coriander leaves and serve immediately. Those eggplants are so adorable. I have never seen them over here. The curry looks so delicious and packed full of flavours. Thanks Angie! We get them here in the Indian grocery stores! This eggplant dish sounds delicious! I love that you shallow fried them instead of a deep fry. What a great way to get creative! Thanks Gayle! was just trying to cut down on some calories, too many festivals coming up! This is my favourite kind of vegetarian curry. Looks delicious. The flavors in this sound amazing! I love eggplant! Manali,This bharwan baigan looks so good and reminds me of back home!! Gorgeous photography girl! This is probably the best looking eggplant curry I have ever seen. It looks SO amazing and jam packed full of flavour… definitely a recipe I need to try. Thanks Manali! Thanks Thalia, glad you liked it! I have eggplants!!! Yay! I picked up some of those little eggplants at the farmers market because they were so cute and now I’m super excited I did! Pinned! Thanks for pinning Lindsey! Can’t wait to see what you do with your baby eggplants, they are really cute! 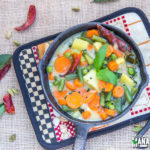 My husband loves curry and I love veggies. This will be a dish to please us both! Can’t wait to try it! Pinned! I love coming to your blog; it always reminds me of home! This is one of my favorite dishes, but it’s definitely a lot of work – and worth the effort! 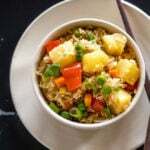 This dish looks wonderful Manali! 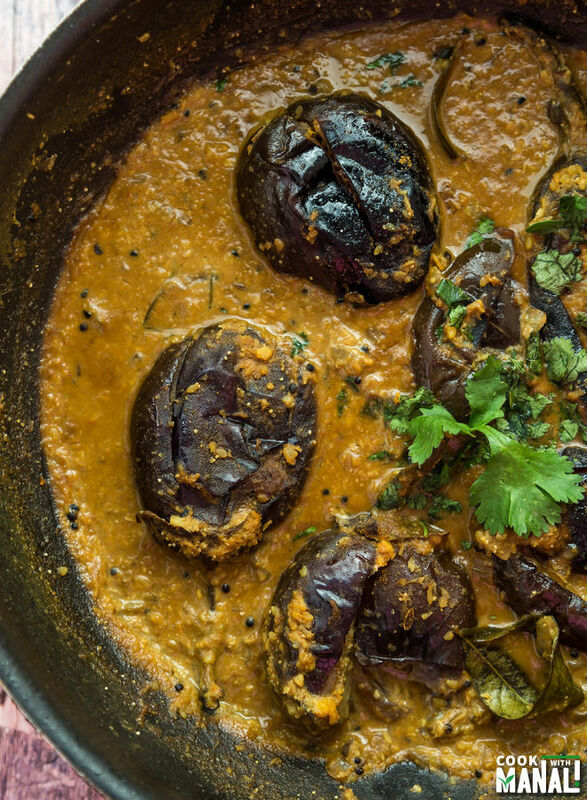 Eggplant curries are some of my favorite curries! I love the step by step photos your provide!! I cannot wait to try this dish for a special dinner 🙂 Pinned! Thank you Ceara! 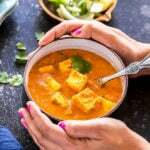 I hope you give this curry a try, it’s one of my favorites! 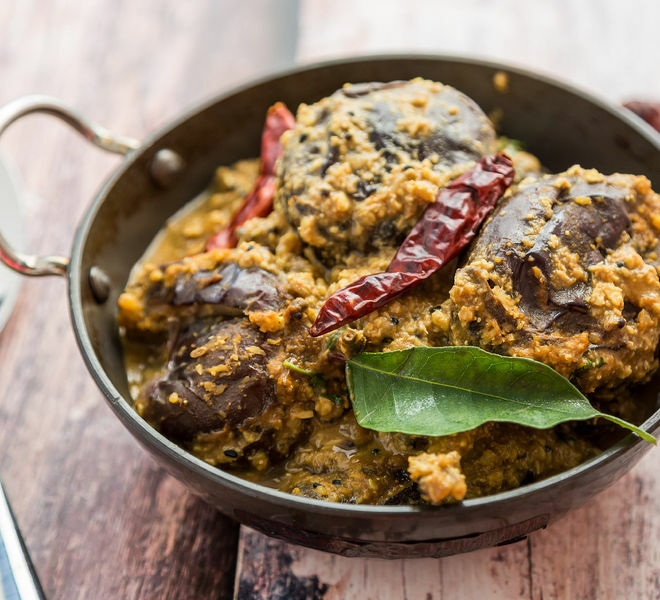 This combines some of my favorite things: eggplant, coconut, peanuts, and of course curry! This may be a silly question, but when you eat this, do you need to take out the skin of the eggplant? I always take off the skin when I cook eggplant, but I have also never used these baby eggplants! 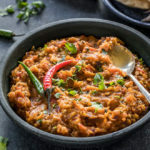 Hi Cara, no question is silly 🙂 We do not take out the skin off the eggplant in this recipe but sometimes we do like in this baingan bharta https://www.cookwithmanali.com/baingan-bharta/ So it depends! But if you are not comfortable with eating the skin, cook the eggplant as given in the recipe and then remove the skin before eating, it should be okay. I hope that helps! 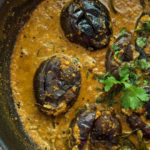 Btw if you love eggplant, you should give this dish a try https://www.cookwithmanali.com/borani-banjan-afghan-eggplant-yogurt-sauce/ it’s one of my personal favorites! Thanks for such a fast reply! Baingan bharta is one of my favorite dishes, and I saw this as a related dish on your website and knew I had to give it a try. I will try the borani banjan as soon as I can, as well! you are welcome Cara! Happy cooking! I order this at a local Indian restaurant. It is my favorite go to dish. I am so excited to have found the recipe. This recipe is fantastic. The second time I made it, I had to sub cashews for peanuts, and tahini for sesame seeds. I also had no poppy seeds or kalonji. But it definitely retained its special and unique mix of flavors. 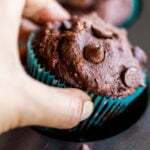 Thanks for this wonderful recipe! My cooking abilities are mediocre at best. My family loves this with biryani and I have made it a few times. Comes out great even if you don’t have kalonji or poppyseeds which I usually don’t. Hi…can I try this without tamarind? Have some allergic members in home.